I am planning to replace the Head Gaskets on my 2005 3.3 V6 Chrysler Grand Voyager and I wondered if I need to replace the Head Bolts? I would suggest replacing them. Head bolts tend to stretch when they are being torqued down, and if reused that stretching can cause problems, later. 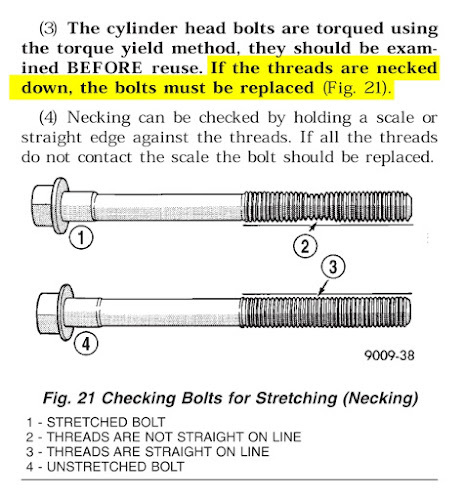 The head bolts in question are torque to yield no stretching. inspect for damages from engine issues but normal circumstances no stretching. 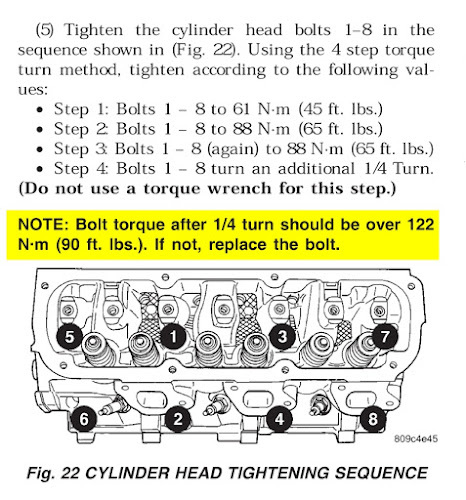 As CHRYSLER TECH said under normal circumstances you should not need to replaces the head bolts. If the headbolts are not readily available in the UK, or if you cannot live without the van while waiting for new headbolts to arrive, you may want to have a set on hand. Heads off over the weekend and the bolts all look in good condition. I haven't worked on a car for a number of years now, so I was a little surprised to find that the Head Gasket is 3 thin pieces of metal with, what appears to be, no compressible material! Are there any tips etc. I should look out for when cleaning and putting this back together? Also, does anyone know what the valve clearances are? Thanks for this; to be on the safe-side, both heads are off to be skimmed at the weekend.